Love Swimming | Kids love us because we’re fun. Parents love us because we’re effective. It's time to learn a fun, life-saving skill! Follow Us! Like Us! Subscribe to Us! 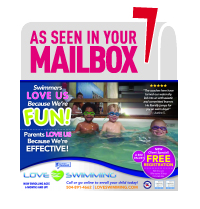 Connect with us to keep up to date on everything Love Swimming! Help us become the best we can be! Kids love us because we’re fun. Parents love us because we’re effective.